There is potentially a school of thought that might suggest, at this exact time in our shared history, experimental music is a vaguely masturbatory luxury. That any work of art, which fails to wear its political intentions clearly and overtly on its sleeve, is surplus to requirement right now. Given that you’ve elected to read this article on this particular website, however, it may not surprise you when I say that this viewpoint is wrongheaded – that resistance has many faces. That powerful politics can just as easily be implicit as explicit, or that experimental music is perhaps more vital now than it has been in years. And, with this in mind, it’s clear also that Bergen’s Borealis is not only an “interesting” festival but also a vital one. Having, the night before departure, been upgraded from my chosen windowless room at a Gatwick Airport hotel to one of their “Vista Rooms” – rewarded with a violet-neon panoramic car park view – I’m naturally prepared for arrival in Norway’s postcard landscape. What wonder is left, after all, in the cluster of small islands and jutting peninsulas visible just from our descent into Bergen, or indeed the seven verdant mountains that surround the former capital itself, when only hours ago you had the pleasure of considering whether anyone could see your illuminated naked body from the not-quite-dark offices within touching distance? Truly, there can be no comparison. At once cosmopolitan and bordering on parochial, Bergen is a very particular kind of city: its arts facilities – the numerous museums, concert halls, galleries, performance spaces, independent venues and colleges – seem vastly and encouragingly disproportionate to its population. Yet the majority of its businesses (including cafes and restaurants) are closed on a Sunday. It’s hard to square these two distinct avatars of Norway’s second city, but over the course of three days a clear picture begins to emerge – of a city seemingly bound to certain traditions by geography and history, but with a vocal and influential cultural majority whom, in all other aspects, are willing and ready to embrace progress. The vein of urban psychogeographic sonics is far from depleted. Steve Reich doesn’t have the monopoly on engrossing percussion performance. It's an obvious point to make, perhaps, but there is drumming beyond Drumming, and in this particular case there is Drums. According to the festival website, Michaela Antalová, Chris Corsano, Anja Jacobsen and Øyvind Skarbø spent a week together in Slovakia some time before this year's edition of Borealis. The result, however – described as "developing a piece that draws on the creative synergies, and tensions, that exist within a group of four individual musical personalities" – feels more cohesive than commissioned. Drums manages to be engrossing on both an individual, cellular level with regard to each of the musicians' unique and undeniable talents, and in its showcasing of exactly what a collective can achieve with only percussion at their disposal. 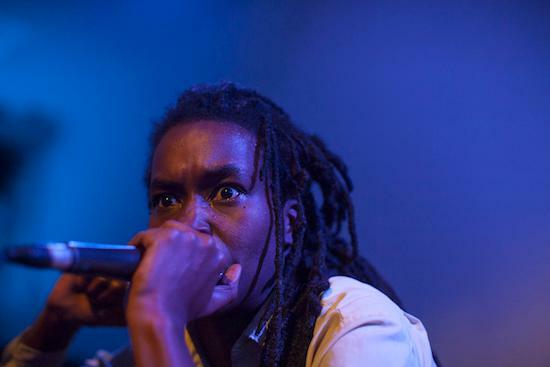 Moor Mother’s music may be built on her personal geography, but it is far from bound by it. The music Camae Ayewa creates as Moor Mother is derived from a very specific experience, moulded by the unique parameters of being black and being American in the mid-late 2010's: the tensions, physical, psychological and philosophical, that she explores and those that she creates – through samples, spoken word, and live electronics – are hung from the scaffold of the inescapable realities of those factors. Yet such deep rooting in such particular lived experience is far from a limitation. 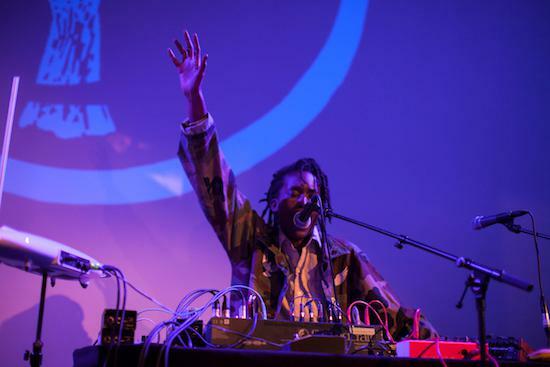 Having seen Moor Mother within the confines of Berghain only the month before at Berlin's CTM Festival, it's no surprise that the world she projects (and it is a projection of reality, rather than a creation) for the duration of her set translates beyond the United States. And yet it's still surprising how effective the set remains – how potent it is – unhampered by the cosiness, carpeted floors and general quasi-ambient, café-style setting of Bergen's Landmark or even by her own technical difficulties. For their part, too, the Borealis crowd are attentive and far from shy about getting involved (one member of the festival delegation in particular is so visibly into it that they deserve this anonymous shout out) – but all of this is really a testament to the Moor Mother ethos and to the fact her music is the crystallisation of absolute anti-agnosticism. Nothing is objective. Nothing is kowtowed. Both everything and nothing are sacred. For all its positive qualities, experimental improvised music can be alienating: what feels immersive to a musician, who undoubtedly is themselves very much immersed, to an audience one degree removed can feel entirely distinct from their own experience. It’s a question, really, of being “in the moment” vs. “watching the moment unfold” in real-time. 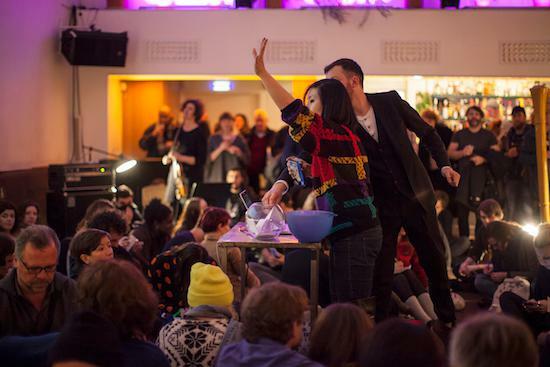 In the final performance of the festival, bodies parked – occasionally too close for comfort – on cushions carried across town from venue to venue, Okkyung Lee seeks to redress this balance. Those familiar with Mat Dryhurst’s visuals for Holly Herndon’s live show will no doubt also be familiar with the permeability of music’s already shaky fourth wall. But, while Dryhurst folds the audience into the events on-screen, a unique sequence unlikely ever to repeat itself exactly, the dialogue remains one way – the crowd willing but static participants. With Chris Corsano on drums, Angharad Davies on violin and Rhodri Davies on harp – all of whom have played their own unique parts in the festival – what Lee creates with still hoping for a miracle…? is essentially its inverse. 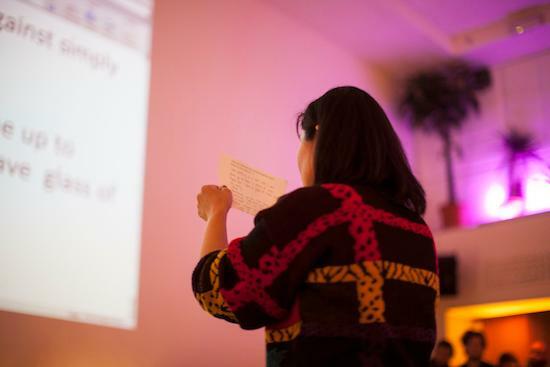 In collecting private answers to pre-written questions – ranging from whether you might have experienced racial prejudice in your life to whether or not t the festival director's haircut might be less than 10/10 – and typing them up on screen to be shared anonymously with the entire room, Lee and her ensemble are able to begin a slow cascade of border dissolving. And in turn, the improvisation of the instruments – with the addition of Lee's cello – while distinct elements at first, isolated and recognisable parts, over the course of an hour become less and less discreet from one another, and from the assembled audience. Eventually, inevitably, it reaches a finale that does not so much crescendo in the traditional dramatic sense but rather in the sense of a cathartic chemical reaction: for some brief moment we have moved from individual objects to a single fluid entity. It's the ideal way to end Borealis; a kind of realisation of what the festival itself is about – a coming together of people against isolationism in the arts as they are in life.